The above products by EcoSMART = My new favorite products!!! Several months ago, I was contacted by a very nice guy named Josh. He explained that he was interested in my doing a review of some products by EcoSMART, who makes, organic insect killer, organic home pest control, and many more products. ALL of these products being child and pet safe! I replied to Josh and said I'd love to do a review of his products, but I had to warn him. I told him that we have a SERIOUS tick problem where I live, and I really had doubts about ANY product being able to keep the ticks away with how infested we are here. When Tick Season (yes, that's a proper noun here) arrived, I e-mailed Josh and asked him to send me the stuff he'd like me to review. I, once again, felt I needed to warn him. I explained that I am always completely honest in my reviews, and I strongly feared that any insect repellent, especially a SAFE organic one, would not work where I live. I said that if by some miracle, this product worked, I'd be singing EcoSMART's praises to the entire world for a long time coming. Josh replied that he was "highly confident" I'd be singing EcoSMART's praises. I recall kind of snickering and telling Hubs that this guy had no idea what we deal with out here when it comes to ticks. Do any of you remember last year when I had to quit going on my walks through the field after pulling 34 ticks off me during one walk? Just sayin'. Well, people LISTEN TO ME!!! The joke was on me! I now want the whole world to read me admit that I was WRONG! EcoSMART's organic insect repellent is my new favorite product EVER! Seriously! It's THAT good! Did you just read that at this time last year, I couldn't walk because I'd get literally covered in ticks with each step??? Well, this year, is different. When my box containing my free EcoSMART's Safe Picnic Value Bundle (which includes Home Pest Control, Flying Insect Killer, and Insect Repellent) arrived, I put my jeans on, tucked them in my socks, sprayed myself with the Insect Repellent, took a very deep breath, and headed out into "Tick Land" (yes, that's a proper noun too). NOT.A.SINGLE.TICK!!! I repeat... I did NOT get a single tick on me!!! O.K., so you're thinking that was just one walk. Nope - People, I don't even hesitate to go crawling through weeds, laying in the grass, or playing in the woods now! I just spray with my new MIRACLE product and don't give it a second thought. Did I mention that this is completely organic and safe?!?! Amazing! There have been times when I've been in weeds/grasses up to my armpits and I've thought, "There has got to be at least one tick on me." I look down and NOTHING! How do I know that it's the product that deserves credit??? Because when I don't use it, I get ticks on me! Plain and simple! Same with Hubs. He's started spraying himself before going to work on fence, and he loves the stuff too. If he forgets to spray, I have to pull the ticks off him, which leave really nasty welts on him. It keeps other insects away too... no mosquitoes or gnats either! 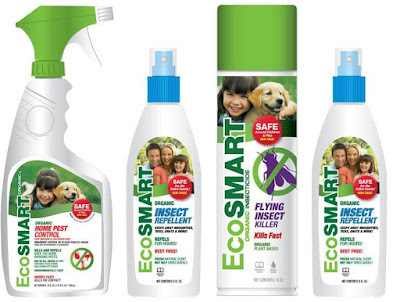 EcoSMART has a full product line of organic pest control products. They also have natural ant killer. As a matter of fact, one of my friends was just asking me how to get rid of ants without spraying stuff that would hurt her many pets. You can bet I immediately volunteered EcoSMART's website! I am ALWAYS honest in my reviews. You people are my friends. As your friend, I feel obligated to tell you how fantastic these products are! This isn't the last you will hear from me about EcoSMART. Not only am I lucky enough that I will be having A GIVEAWAY of EcoSMART products, but I'll also be telling anyone who will listen about how great their products are for a very long time to come! Oh, and I'll be purchasing more organic insect repellent... IN BULK! I never, ever want to be without it!!!!!!!! I am trying to convince my husband that the ant killer is extremely effective, he still wants to get back to the creepy poison stuff. Not with 2 dogs and a 4 year old daughter!